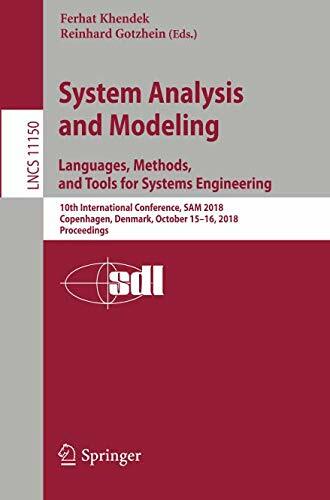 This book constitutes the refereed proceedings of the 10th International Conference on System Analysis and Modeling, SAM 2018, held in Copenhagen Denmark, in October 2018. The 12 full papers and 2 short papers presented were carefully reviewed and selected from 24 submissions. The papers describe innovations, trends, and experiences in modeling and analysis of complex systems using ITU-T's Specification and Description Language (SDL-2010) and Message Sequence Chart (MSC) notations, as well as related system design languages ― including UML, ASN.1, TTCN, SysML and the User Requirements Notation (URN). This year’s edition of SAM will be under the theme “Languages, Methods, and Tools for Systems Engineering”, including languages and methods standardized by the ITU-T, and domain-specific languages. Also included are software engineering technologies, such as for requirements engineering, software verification and validation, and automated code generation.